Lemax Victorian Flyers Ferris Wheel themed musical table piece depicts a delightful Christmas seasonal fairground ride, enjoyed by Children and families alike. Delighted ferris wheel riders enjoy the view over the carnival, as their seats rise and fall in the illuminated big wheel, revolving to vocal and musical soundtracks. Suitable for placement in and amongst a seasonal Lemax village Christmas scene. A real Christmas spectacle centrepiece for a Lemax themed display. A recent addition and a Lemax favourite, this showpiece collectable model joined the Lemax Caddington Village growing collection in 2014. 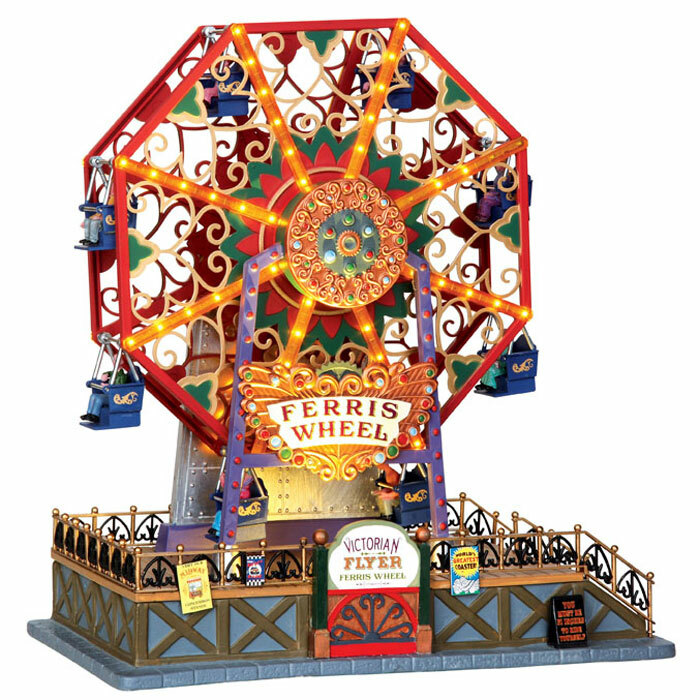 Flyers Ferris Wheel offers a delightful self standing animated, illuminated and musical carnival model on an individual base to compliment your seasonal Lemax Village.